10 X 5 X 5.5"
10.37 X 5.12 X 3.5"
12.5 X 9.37 X 3.5"
13.5 X 9 X 3"
13.5 X 9.87 X 3.37"
Custom printed food boxes are a great way for your restaurant to generate buzz in your neighborhood or community. 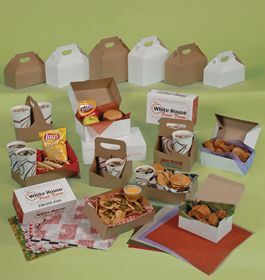 Food boxes need to have a catchy look to them in order for them to effectively market an eatery, and the custom content that is created by the team at APlasticBag.com is sure to do the trick for you and your business. From bright logos on the center of the boxes to the restaurant's name at the top of the box, customized content gives business owners the chance to totally design their own food boxes. 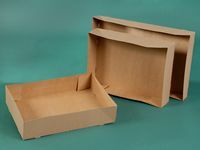 Custom food boxes are an economical way for companies to advertise their brand, and they give customers the packing material that they need to safely get their food from the restaurant to their dining table. APlasticBag.com has a wide selection of food boxes in different sizes and colors, and we also have boxes that are microwave safe for leftovers. 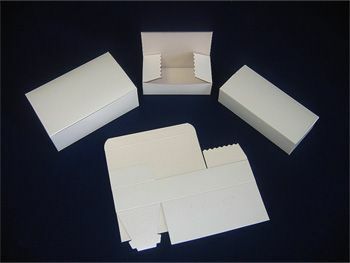 When you turn to APlasticBag.com for your boxes, you gain access to our rush production capabilities as well. We also offer an on-time delivery guarantee on any order that is placed through our Website. If you want to learn more about our products or you have a question about the customization process, we invite you to get in touch with our team now. Your source for Food Boxes and Retail Boxes.